From South London label Unit 137, who previously brought us Hylu and Jago’s dubbed-up mixes of the Anansi Riddim (see reggaemusic.org.uk 25th July 2012), along comes a new EP of versions around the Youthman Riddim. This is the first full-length release from producer Sleepy Time Ghost (who also featured on the Anansi Riddim mixes). This time round we find two treatments of the Youthman riddim, from Ras Demo (aka Demolition Man) and Lionpulse, plus a remix from Hylu and Jago and a very strong dub from Joe Ariwa, alongside father the Mad Professor himself. The release opens with ‘Rule Your Destiny’ with its pure vintage style roots vocal over the established Youthman rhythm track. This is followed through with ‘Bad Days are Gone’ with a very different DJ-style vocal treatment over the rhythm, breaking off mid-way through into a brass/bass interlude before returning to the vocal and a dub conclusion: a great track that hints at the glory days of dub but manages to avoid sounding retro, a powerful version that is likely to be widely and loudly played. Joe Ariwa’s ‘Youthman Dub’ is an excellent bass-driven dub of the original rhythm, clear and sharp, echoing away like there is no tomorrow and propelling dub into 2013 where it belongs. The fourth and final track is ‘Bad Days are Gone’ again, this time featuring Lionpulse in a remix from Hylu and Jago: an elaborate mashed-up forward-looking mix reminiscent of both dancehall and dubstep, all at one-and-the-same time in a strong steppas treatment – an exhausting conclusion to a fine release. This download-only compilation from Mr Bongo records features ten tracks from their highly varied world catalogue. Happily there is strong representation here from the fine reggae producer Prince Fatty with his ‘Kung Fu Battle ina Brixton’ (featuring Horseman) and also from Fatty’s separate collaboration with Hollie Cook in the excellent dub of ‘Crying’, both of which have been reviewed more fully on these pages before (see reggaemusic.org.uk April, August and October 2012). More surprising are some diverse and intriguing contributions from around the globe. These include CK Mann and his Carousel 7 which, apart from being a marvellously named band, provide rhythmic roots from Ghana in the form of ‘Asafo Beesuon’, a lengthy extended pulsing track with CK’s distinctive guitar making itself very evident. Great, and unique, and sounding as though it embraces the influence of several continents all in one song. The venerable Ebo Taylor brings more West African rhythms in the shape of ‘Heaven’. It remains as difficult as it ever did to know what to make of the thrashing guitar and psychy-era phasing effects of the Incredible Bongo Band, except to note that ‘Last Bongo in Belgium’ is not the best song I’ve ever heard, but it does have a rather impressive title. Tom Ze’s ‘Sao Paulo’, the Salvador Trio’s ‘Tristeza’ and Joyce’s ‘Aldeia De Ogum’ all add a musical contribution, albeit of contrasting styles, from Brazil. There is a distinct vintage sound to some of the tracks, but Novalima’s ‘Machete’, from Peru, has a sharp contemporary feel. The collection closes with the late American Terry Callier’s live recording of ‘Lazarus Man’, a fine blues and jazz crossover. So as well as those who will know Mr Bongo Recordings for their recent and accomplished reggae output, there is plenty here from around the world for the musically curious to explore. From the folks at Springline Records/Come Fi Conquer we encounter an album fashioned not in the trial and tribulation of Kingston, Jamaica, but in the mean streets of Willesden, North-West London. Like previous releases from this undervalued label the sound, feel and message remain true to the origins of the music and its guiding influences. The album opens with ‘Silver Locks Crackin’, a no-nonsense skanking start to the proceedings, followed up with ‘Playing Good Vibes’, a master lesson in slow, spiritual, melodic roots from Yabass, featuring also the contrasting input of Michael Rose. 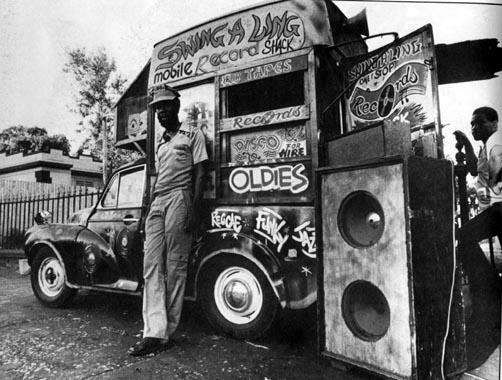 This strong and impressive track is followed immediately by its dub, ‘Vibez a Wa’, with Jah Wa Wa making another guest contribution – a great dub production with snatches of the original vocal and even a touch of ‘row fisherman row’ and ‘down by the riverside’ in there somewhere, this is a fine deconstruction with all the elements of a dub-era classic mix and something that sounds almost like a Tubby-era hi-hat making itself known. ‘Community Rocker’ itself comes in with a busy dubby mix, and a lot going on around and behind the simple ‘community rocker’ line and the repeat bass phrase beneath. ‘Fear No Evil’ opens with its brief childlike vocals and a biblical message, then is straight into a deep dub-led mix, along with melodica-sounding instrumentation and a sparse drum and bass pattern. A doomy sort of feel indeed. ‘Who Jah Bless’ is a delightful discovery – again, a simple repeating vocal figure, this time with a striking keyboard intervention reminiscent of play-the-organ-at-home adverts of bygone days, after which the instrumentation and vocals are stripped away to go into an echoing bass-heavy dub before reintroducing the vocals: a brilliant little track, and quite unlike anything else recently encountered, closing with a nice spoken rhetorical question: ‘who could beat that?’ Indeed – and a great job from producer Gibsy Rhodes. Listen at the You Tube link below – it’ll spread!. Next up, ‘Judgement Day’ is thoughtful roots music, nice percussive sounds in the background, a subtle and interesting mix and the album ends on a high with ‘Natural Situation’, a splendid dubbed-up rhythm track. A surprisingly strong album and a most rewarding way to spend 32 minutes of your life: have a listen.